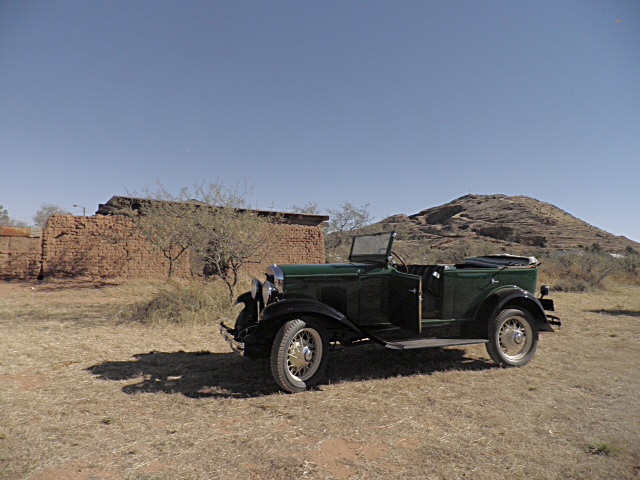 Just two miles down the road from Sunsites, at t he beginning of the Ghost Town Trail, Pearce, Arizona is a “living ghost town”. As it is commonly known, Old Pearce has a kindergarten through 8th grade school, and some students attend class in a 100 year old building. Three retail stores welcome visitors to shop all year long. There is a pottery shop, a goat milk soap shop (Marcia’s Garden), and a gift shop (Prickly Pear). All of these stores are in or associated with historic buildings. A mining company, Commonwealth Gold and Silver, has refurbished the original mine manager’s home and the original Catholic church. This year, 2015, the Old Pearce Preservation Association will celebrate the jail’s 100th anniversary. However, there may need to be a jail “break in”, because the only known key is in the custody of a man who won’t relinquish it. Just down the road from the jail is the historic Pearce Cemetery. Residents today continue to use the cemetery, and a walk through the desert grounds is a walk through time. The top photo is a picture of the jail. 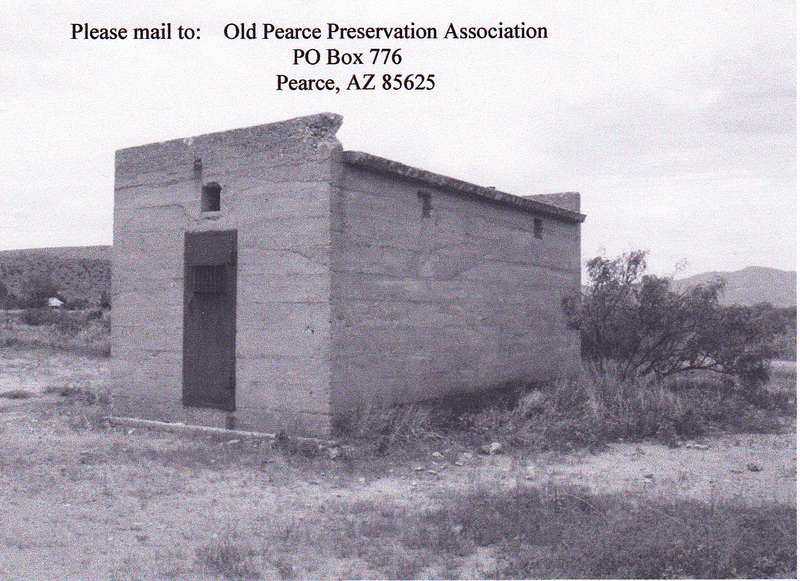 Note the address for contacting Old Pearce Preservation Association. The bottom photo was taken in Pearce by Carolyn Gray, the owner of the car “Eddy”. “Eddy” once “lived” in Pearce, and Carolyn returned him to Pearce to take this photo. 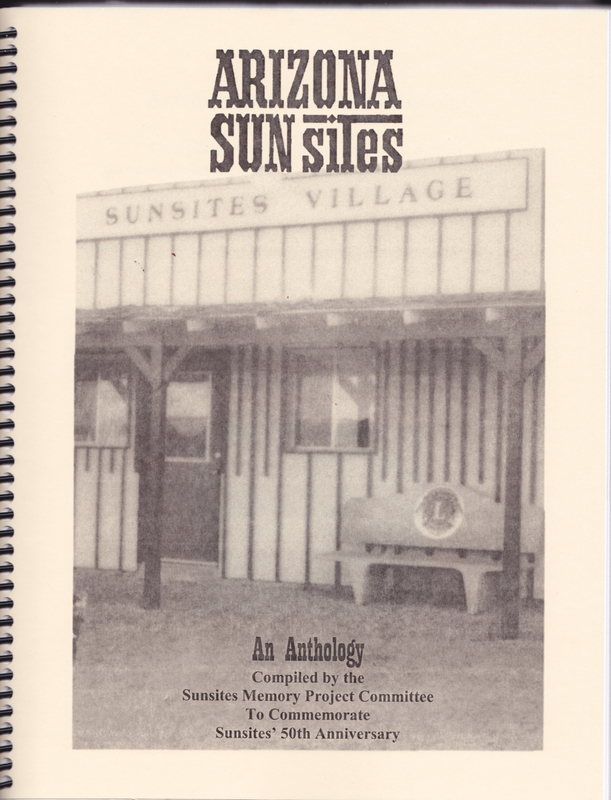 A book of stories about Sunsites. With just a little over four months left before Sunsites’ 50th year comes to a close, residents of Sunsites continue to come up with ideas for commemorating our past. Pictured above is the book available through the Friends of the Pearce-Sunsites Community Library, PO Box 374, Pearce, AZ 85625. Phone/Fax 520-826-3866. The Cochise Stronghold Lions Club is spearheading a village-wide celebration on November 9-10. Thank you, Lions Club, for taking the lead on pulling together Sunsites Golden Days, two days of special events that will include a wine tasting, an art show, a “cruise in”, a quilt show, entertainment, a Frontage Road scavenger hunt, steak fry at the VFW, pancake breakfast, history displays, kids’ activities with the fire department, prizes and more. The Cochise Stronghold Lions Club has been a presence in our village almost from the beginning. The vintage photo on the anthology book cover shows the bench donated to the community by the Lions. Our two co-ops (Sulphur Springs Valley Electric Cooperative and Valley TeleCom Group) will also lend their support to our community. Please take a moment to “like” them on Facebook through the blogroll in the right hand column. These two co-ops have played a critical role in Sunsites’ development. Valley TeleCom Group also has its 50th anniversary this year. Two weeks after our Golden Days, the Old Pearce Preservation Association, will put on their annual Thanksgiving weekend Heritage Days. Learn more about the history of Sunsites and Pearce in the book “Pearce and Sunsites”, the Images of America book available through Amazon. What Would Andy Taylor Do? In one of the first stories I wrote for this blog, I compared Sunsites to my home town of Lamesa, Texas. Now I’d like to mention fictional Mayberry, home of Andy Taylor. I have held back on mentioning the challenge we in Sunsites have faced for more than a year. Sunsites’ 50th anniversary has been overshadowed by controversy over our golf course. Over the years, lots of small towns across the United States have struggled to preserve their golf courses. Sunsites is no exception. Our most recent struggle has divided the residents of our village. While emotions raged, I gave much thought to Andy Taylor, sheriff of Mayberry, and to my father Ralph Kinsey, a small town attorney who also served as city attorney and then county attorney. How would Andy Taylor or my father have counseled residents caught up in the passions of a local dispute? I think Andy would have reminded Aunt Bea and Clara that no matter the outcome, when the dust cleared, they would still be standing side by side in the church choir, sitting next to each other at the beauty shop, and grieving together over the death of a friend. As far as counseling “law and order” Barney, I believe Andy would tell Barney that sometimes it’s better to look the other way. Issuing speeding tickets and jaywalking tickets may be following the letter of the law, but sometimes, in a small community, compassion and understanding are more important to the lives of the people who rely upon each other. Floyd’s barber shop, the typical gathering place for political discourse, could have been a hotbed of emotions, but Andy would have been the voice of reason. I believe that Andy and Ralph Kinsey, both in law and order professions, would have understood that mediation trumps litigation, and they would have practiced what they preached. Both understood that small towns and small counties don’t operate like the big city. Big city thinking and solutions don’t always work in rural settings. My father, a county attorney, didn’t have the background or the highly-honed skills (or, might I add, the salary or staff) of the attorneys in Houston or Dallas or Phoenix. He dealt with people on a case-by-case basis. The residents of the county did not expect him to operate his office like a similar office would have operated in the city…nor did they want him to. Within the walls of the courthouse, Ralph Kinsey preferred mediation over litigation for the good of the people and the town. Andy Taylor and Barney were fish out of water in the big city, but they always won out when it came to observing people. I can just see Andy Taylor getting combatants to sit down and talk things out, asking them to see the other person’s side. Andy Taylor and Ralph Kinsey reserved litigation for the really bad stuff that happened and for the really bad people. Sunsites has been the center of litigation at great cost to Cochise County, to the merchants of Sunsites, to our reputation as a friendly little town, and to the residents caught in the middle of a controversy that they did not choose. We can’t turn back the clock, but I think we have all learned lessons. Litigation hurts. Mediation heals. Here we are…one year later. If you look back at our past blogs, the Vintage Cruisers from Mesa came back to help us with special events to commemorate Sunsites’ 50th anniversary. On Wednesday, March 28, the Cruisers drove to Old Pearce to tour the Old Mercantile Store and to help dedicate the first of two plaques explaining why the Pearce Post Office is in Sunsites. President of the Old Pearce Preservation Association, Don Hammer, spoke to the group and explained the many activities that go on in “Old Pearce”. At noon, we all headed to the golf course for a special balloon lift-off sponsored by the Friends of the Pearce-Sunsites Library. The photos in this slide show were taken by my friend Carol Cartmell, and I love the photo of me with the “hands” announcement board. If you look closely, you can see the cover of the 50th anniversary Arizona SunSites book that will be available for sale through the library beginning next week. After the balloon lift-off, and two more displays of the Vintage Cruisers’ cars (one at Great Western Bank and one at the golf course), the day ended with the dedication of the plaque at the “new” Pearce Post Office. The photos show Ralph Score from Valley Telecom practicing the “unveiling” of the plaque with Murray McClelland, the president of the Chamber of Commerce, and Bill Bothman on the right, the Postmaster. Bill hugs our special guest, former Postmaster Jessie Lee. The Sunsites golf course attracts migratory ducks and birds. 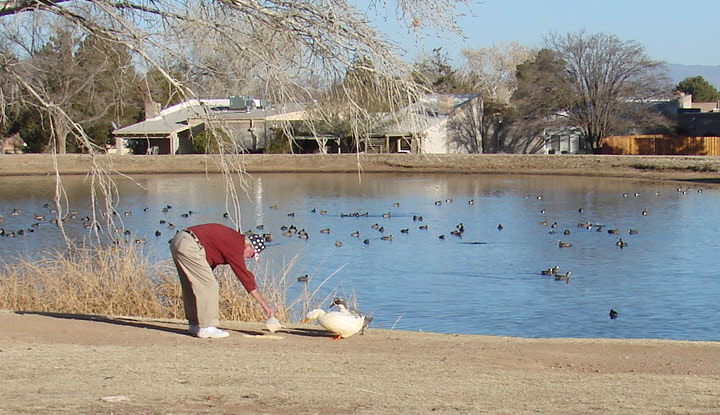 Ray Harrison goes out every evening to feed the resident ducks and the "winter visitor" ducks. This is it. This is the year for Sunsites to celebrate fifty years. I want to say thank you to everyone who has subscribed to this blog and for your support. The Pearce and Sunsites book has exceeded expectations. Now the Sunsites Memory Project has begun work on the Volume II book that picks up where Harry O’Neil’s book The Land Before Horizon leaves off. Every day I look around Sunsites, and I give thanks for the wonderful life I have here and the small moments that make a difference. How special to drive, walk, or bicycle down our quiet streets and to have everyone speak and wave and call you by name! Mary Adams, our bank manager, and her staff go out of their way to provide space for history exhibits and for book signings. Our Great Western Bank makes such a difference in our lives. It’s not just a bank, it’s a gathering place…and even doggie customers are welcomed with dog biscuits. Our postmaster Bill Bothman and his staff give a personal service that you rarely find in a post office. Another gathering place, the post office is the place to head when you have a question. Check out the Sunsites Community Association’s popular bulletin board next to the post office building, and visit with everyone who comes by. The community library draws people from all over the Sulphur Springs Valley. Our librarian Louise Sirois, along with volunteers and the Friends of the Library, has created one of the best little libraries in the area. Activities that range from exercise classes to BINGO fill our beautiful community center from morning to night. The adjacent Stronghold Area Recreational Park hosts ball tournaments and has a beautiful playground. Our excellent fire department and highly trained EMTs give us a sense of security, and the community just completed our brand new heliport. We are so fortunate to have our wonderful small businesses. You’re instantly recognized when you walk in the door. Our golf course, designed for the enjoyment of the entire village, has endured through good times and bad. With its trails and ponds and green spaces, it attracts winter visitors from around the globe, and migratory ducks and birds join our year-round feathered residents. I hope to hear from you, and thank you for your support.